In 1988, following a $30 million gift from alumnus Leonard N. Stern (MBA 1959), the school improved its facilities, and was renamed the Leonard N. Stern School of Business. Ten years later, in 1998, a $10 million gift from Henry Kaufman (PhD 1958) supported a major upgrade of Stern’s facilities. In 1999 came a similar gift from Kenneth Langone (MBA 1960). In 2000, Stern celebrated its centenary with the launch of a $100 million Centennial Campaign, which helped the school double its endowment, enhance the number of named professorships, and increase financial aid to students. Here are more facts about the school, with a focus on its full-time MBA program. NYU Stern is located in the center of Greenwich Village, near Washington Square Park in downtown Manhattan. New York City was founded at the southern tip of Manhattan, an island bounded by the Hudson, East, and Harlem rivers. Manhattan is the headquarters of the UN and often described as the financial, media, and entertainment capital of the world. Three of the most-visited tourist destinations in the world (as of 2013) are in Manhattan: the Times Square, Central Park, and the Grand Central Terminal. Besides, the Empire State Building, the New York Stock Exchange, and NASDAQ are located in Manhattan. 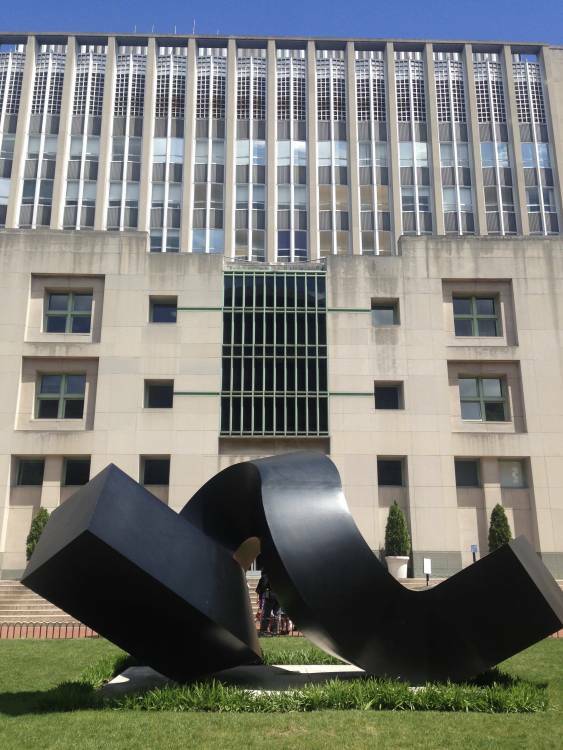 Universities such as Columbia and Rockefeller, besides NYU, and various educational institutions such as the Weill Cornell Medical College are located here. Manhattan, with a population of 1.64 million, along with the rest of New York City (pop. 8.5 million), attracted 61 million tourists in 2016. As for the climate, New York City experiences cold and damp winters, with a daily mean temperature of 0.3 degree Celsius in the coldest month of January. Spring and autumn can be chilly to warm, and summers warm to hot and humid, with daily mean temperatures touching about 25 degrees C.
Stern occupies the Shimkin and Tisch Halls and the Kaufman Management Center on NYU’s Washington Square campus. In 2010, a renovation of 84,500 square feet of the three buildings was completed as part of the donor-aided Stern Concourse Project. In FT’s Global MBA Ranking 2017, Stern is ranked 19th, the same position that the school received in the two previous years. In US News’ Best Business Schools ranking 2017 (for US schools), Stern is at rank 12 along with Duke Fuqua. Stern is the third-best b-school for MBA in Finance in the US, according to US News. The leadership team at Stern is headed by Dean Peter Henry, the youngest person to hold the position. He assumed deanship in 2010 and joined the faculty as the William R. Berkley Professor of Economics and Finance. Stern professors have made regular contributions to research and are authors of books and articles in top journals. In 2011, Stern Professor Thomas J. Sargent won the Nobel Prize for Economics in the wake of other Nobel Laureates from Stern — Michael Spence (2001), and Robert F. Engle (2003). Besides academic departments such as those of accounting, finance, and marketing, Stern has developed research centers including the Berkley Innovation Labs, Center for Business Analytics, and Center for Globalization of Education and Management. Stern has a variety of MBA programs, such as Full-time MBA (two years), Tech MBA (one year), and Fashion and Luxury MBA (one year); part-time MBA at Manhattan and Westchester (two to six years); dual degrees, such as MD/MBA, JD/MBA, MBA/MFA; executive MBA programs, such as EMBA New York City (22 months) and EMBA Washington, DC (two years); TRIUM Global MBA for senior executives offered by Stern, LES, and HEC Paris (17 months); undergraduate courses; master’s programs; PhD programs; executive programs for companies and individuals; and certificate programs. 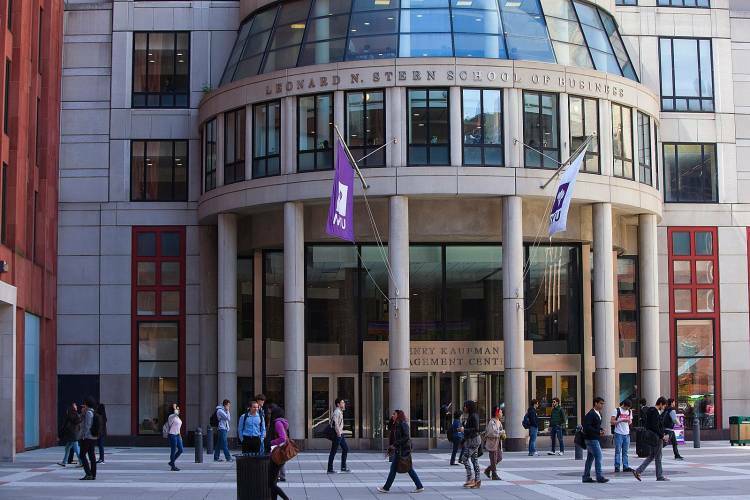 The two-year full-time MBA at Stern is customizable. The first-year curriculum comprises the required core and menu core courses. The required core courses consist of financial accounting and reporting, and statistics and data analytics. Under the menu core, which includes firms and markets, foundations of finance, global economy, leadership in organizations, marketing, operations management, and strategy, five areas are to be chosen. In the second year, up to three specializations can be chosen from over 20 options and electives from over 200 options. Twenty-five percent of courses (five courses) can be taken at other NYU graduate schools. Students can also participate in the semester exchange at 47 Stern partner schools in 30 countries. The DBi (Doing Business in) program of one or two weeks is available around the world between semesters and other breaks. Additionally, Stern offers experiential learning opportunities to tackle real-world problems in real time. One Stern MBA application is adequate for candidates to apply to four MBA programs (full-time, part-time, tech, and fashion and luxury). An application for both a primary and an alternative program can be made if the candidate so chooses. Candidates who represent Stern’s core values of “IQ + EQ” and demonstrate excellent intellectual ability, interpersonal skills, and a desire to serve business and community are preferred. Their academic profile, personal achievements and aspirations, and personal characteristics are also evaluated. The candidate needs to submit three essays—an essay each on professional aspirations and program preferences, and a personal expression essay. The personal expression essay should consist of six images (photos, infographics, drawings, etc.) with captions that best describe the candidate to the admissions committee and future classmates. An additional 250-word essay can be submitted if the candidate desires, explaining gaps in employment, plans to retake GMAT, etc. Besides, two professional recommendations have to be submitted, one of which from the current supervisor. An emotional intelligence (EQ, self-awareness, empathy, communication) endorsement from a professional or personal recommender (excluding family) is also required. Other requirements: GRE/GMAT score, TOEFL/IELTS score (if English is not the native language of the candidate or if he/she holds a university degree not taught in English); transcripts, degrees, and professional information. The application fee is $250. An invitation is sent to candidates selected for an interview. The first-year full-time MBA tuition is about $72,000. The registration fee is approximately $4,000. Living expenses include room and board (~$26,000), books and supplies (~$2,000), transportation (~$1,100), and miscellaneous (with health insurance) ~$8,750. The cost of attendance for the first year comes to around $111,000. About 25 percent of admitted two-year MBA students receive merit-based scholarships. The scholarships include Dean’s Scholarship, Named Faculty Scholarships, Consortium Fellowships, Stern Scholarship, William R. Berkley Scholarship, Advancing Women in Business Scholarship, and Forté Fellowship. International students can apply for private loans with or without a US cosigner. Here’s the Class of 2019 profile: Applicants – 3,927; enrolled – 399; women – 38 percent; international – 37 percent; average age – 28; age range – 21-38; average GPA – 3.48; GMAT average – 714, range – 580-780; undergraduate majors in business – 36 percent; economics – 18 percent; engineering, math, science – 17 percent; humanities, arts – 16 percent; social science – 13 percent; students with prior work experience – 99 percent; average work experience – 4.9 years; work experience range – 0-15 years; prior industries include financial services – 29 percent, consulting – 13 percent; retail/government/tech – 7 percent; nonprofit/arts – 6 percent; PR/media/real estate – 4 percent. Stern’s career development team maintains relationships with all industries and ensures that thousands of recruiting interviews are conducted at the school every year. The Office of Career Development hosts sessions around industry discussions, resume reviews, networking workshops, and mock interviews. The Office is made up of relationship managers, career counselors, and a director for international career development. Second-year-MBA career-coaches counsel first-year students on career search plans and interview skills. Student-run professional clubs also provide career coaching, and the Career Center for Working Professionals offers lifelong career services to alumni. Ninety-four percent of “Sternies” of the Class of 2016 received a job offer within three months of graduation. 28.5 percent went into (by industry) consulting, 28.2 percent into investment banking, and 9.6 percent into technology/telecom. Forty percent took up finance jobs (by job function), 33.8 percent consulting, and 15.1 percent marketing/sales. Companies from various sectors have hired Stern graduates for internships or full-time jobs (see link in Resources No. 18 below, “employer-list” for details). Stern graduates (Class of 2017) received an average base salary of about $121,000, an average signing bonus of ~ $33,000, and an average other guaranteed bonus of ~$30,000. NYU Stern’s alumni network consists of 105,000 executives in 120 countries from Argentina to India, Russia, and Venezuela. NYU SternConnect enables alumni to stay in touch among themselves and reconnect with the school and faculty. “Stern Inside,” a monthly e-newsletter, provides alumni news and information about faculty research, campus events, and career opportunities. Apart from the Nobel Prize winners mentioned under “Faculty, research” in this article, among other notable Stern alumni are Edward Altman (economist), William R. Berkley (President, WR Berkley Corp.), Robert Greifeld (CEO, NASDAQ), Alan Greenspan (former Chairman, Federal Reserve), Nomi Prins (former MD, Goldman-Sachs), Ismail Merchant (film producer), and Daniel Shulman (CEO, PayPal). One of the oldest b-schools in the world, NYU Stern is a founding member of the Association to Advance Collegiate Schools of Business. There are three Nobel laureates on the Stern faculty. Stern’s the place for any candidate who wants to specialize in finance, sales, trading, or luxury brand management. Its location in New York City, just 5 km from Wall Street, and its various campus events provide its students and graduates with an additional advantage when it comes to networking. This might not be a great or worthwhile question – but why do you think Stern does poorly with the Economist and Bloomberg rankings? Since US News and FT both rank NYU within the top 10-12 US B-schools regularly, I wonder which ranking is the best for International students to follow? It definitely is a worthwhile question, Bitun. At the outset I have to admit that I’m not a big fan of rankings. They can never capture what’s truly relevant for each and every applicant from every part of the world. The reason Stern doesn’t rank well in every ranking has a direct correlation to the methodology followed by the publication. Some like FT  Forbes give a lot of importance to salaries (and NY salaries clearly have an edge over the other cities). US News is relatively more qualitative, but it also relies on the opinions of deans and employers. The Economist methodology generates more shock value than real insights. Businessweek has been constantly tweaking it methodology, so there are consistency issues over the years. The bottomline is, for an international student, it’s best to take the rankings with a fistful of salt and create an independent methodology using parameters that are more important from a personal perspective. For instance, if your aspiration is to work on Wall Street, your odds of breaking in improve dramatically if you attend Stern, Columbia or even Cornell – as opposed to INSEAD which might be ranked number one in the world by FT.
Gotcha – Thanks Sameer bhai.